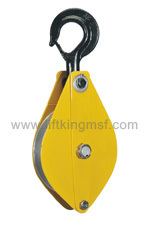 Hand pulley blocks are use to make lifting easier by redirecting a force. They allow the operator to use their full weight as a pulling force. 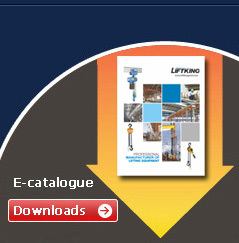 This lifting equipment is manufactured in accordance with EU standard EN 13157:2003 and has built in safety features, such as a secure locking system, that ensures the safe lifting of heavy loads. A hand pulley block has many applications and is commonly used as part of a pulley system in construction and factories. They are built from strong and reliable material and are intended for use with steel wire rope and fiber rope. The groove and sheave is constructed from high quality machined alloy steel. ● A Hand Pulley Block is used to change the load line direction with a machined steel sheave. - HPB, a U.K. design, is used to change the Load Line direction with a machined steel sheave. - Drop forged, heat treated swivel hook and latch with stretch indicator and identity code. - Can be furnished with bronze bushings or roller bearings. - Opening feature permits quick insertion and positioning of rope on the sheave. - Blocks can be securely locked by swinging the hook in the direction of pull. - Groove and sheave is made from high quality machined alloy steel to suit its intended rope diameter. - For Use with steel wire rope and fiber rope. - Manufactured in accordance with European standard EN 13157:2003, and the machinery directive 98/37/EC.